Flumen Dei repletum est aquis, parasti cibum illorum: quoniam ita est praeparatio eius. Rivos eius inebria, multiplica genimina eius: in stillicidiis eius laetabitur germinans. ...the river of God is full of water; thou providest their grain, for so thou hast prepared it. Thou waterest its furrows abundantly, settling its ridges, softening it with showers, and blessing its growth. "Baptism, the gateway into communion with Christ, is...interpreted for us here as rebirth...Rebirth involves the power of God's Spirit, but it also requires the sacrament of the maternal womb of the receiving and welcoming Church. "Spirit and water, heaven and earth, Christ and the Church, belong together. And that is how 'rebirth' happens. In the sacrament, water stands for the maternal earth, the holy Church, which welcomes creation into herself and stands in place of it." 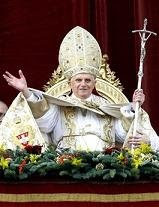 Pope Benedict XVI, "Jesus of Nazareth", pp. 239-240. Meeting Christ in the Liturgy offers a reflection for The Third Sunday of Lent. "I am in anguish" says the rich man, as he gazes upon Lazarus, and he begs Abraham: "Send Lazarus to dip the end of his finger in water and cool my tongue." Lazarus' finger is capable of carrying only the smallest drop of water. Now, in Mercy, we have poured out for us an overwhelming flood of divine grace. Our poor parched souls have more than we can ever drink in the Lord's self-offering. Drink deeply of His grace in the Eucharistic Blood. Feast richly to satisfy the hunger for Life everlasting. "You will drink my cup." Of His chalice will drink all those who are faithful in witness to Him: "The world will hate you because of me." In union with His suffering our crosses also become, like His, the source of resurrection and new life. In each Holy Mass the fountain of water and blood flow again from His side: "Unless you eat the flesh of the Son of Man and drink His blood you have no life in you." Apart from Him we can do nothing. Without His Flesh and Blood there is no escape from the grave. We can become "as radiant as light", God's own light, in the grace of Christ who was transfigured on the mountain. Shall we choose light? Let us, then, "put off deeds of darkness and put on the armor of light". Let us put on Jesus Christ in faith, hope and love. Meeting Christ in the Liturgy offers a reflection for The Second Sunday of Lent. Photo by author: Bay of Naples and Vesuvius. Interrupit petram in eremo; et adaquavit eos velut in abysso multa. Et eduxit aquam de petra: et deduxit tamquam flumina aquas. 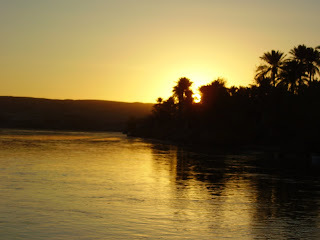 Photo by author: Sunrise Christmas Eve, Euphrates River near Juba, Iraq. Salvum me fac, Deus: quoniam intraverunt aquae usque ad animam meam. Infixus sum in limo profundi: et non est substantia. Veni altitudinem maris: et tempestas demersit me. Quoniam exaudivit pauperes Dominus: et vinctos suos non despexit. Laudent illum caeli et terra, mare, et omnia reptilia in eis. 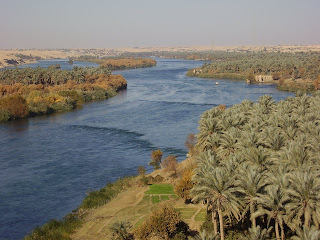 Photo by author: Euphrates River near Juba, Iraq. Fluminis impetus laetificat civitatem Dei: sanctificat tabernaculum suum Altissimus. 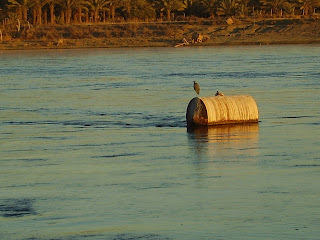 Photo by author: Euphrates River, vicinity of Haditha, Iraq. "Expandi manus meas ad Te"
Photo by author: Desert near Rawah, West Anbar, Iraq. "With Christ against the devil"
"But what does it mean to enter into Lent? It means the beginning of a time of particular duty in the spiritual combat in which we oppose the evil present in the world, in each one of us and around us. I would say to look evil in the face and struggle against its effects, above all against its causes, all the way to its ultimate cause, that is satan (...) To enter into Lent signifies therefore to renew the personal and community decision to confront evil together with Christ." Jesus Christ is the true Manna, for he is from heaven and the One who says "The Bread that I shall give is My Flesh, for the life of the world." He gives Himself, the Bread of Life, so that we shall never be abandoned in our hunger alone before the power of Satan. The Father answers our prayer for "daily bread" in the gift of the Son. Jesus Christ is the Water from the rock. Our thirst for God is satisfied with living water - the fountain welling up to eternal life is the blood and water flowing from the side of Christ as He gives Himself completely on the cross. Lord, give us this bread to eat always. Be for us the Living Water that promises to satisfy our thirst for God. Photo by author: Fiumelatte, Lago di Como, Italia. "We cannot repair all the destructions of the past"
Justice for all: but "not all will be equal"
We all desire a fair world. But we cannot repair all the destructions of the past, all the people unjustly tormented and killed. Only God himself can create justice, which must be justice for all, even for the dead. And, as Adorno, a great Marxist, says, only the resurrection of the flesh, which he considers unreal, could create justice. We believe in this resurrection of the flesh, in which not all will be equal. It is common to think today: whatever is sin, God is magnificent, he knows us, therefore sin does not matter, in the end God will be nice with everyone. It is a beautiful hope. Yet, there is justice, and there is true guilt. Those who have destroyed man and earth cannot suddenly sit beside their victims at the table o God. God creates justice. We must have this present. It seemed thus important for me to write also this text [Spe Salvi] on purgatory, which for me is such an obvious truth, so clear and also so necessary and consoling that is cannot be forgotten. I tried to say: perhaps there are not so many who have destroyed themselves thus, who are forever incurable, who do not have any element left upon which the love of God may rest, who do not have in themselves a minimum capacity for loving. This would be hell. On the other hand, they are certainly few - or at least not many - those who are so pure as to be able to immediately enter in the communion with God. Very many of us hope that there be something curable in us, that there be a final desire to serve God and to serve men, of living according to God. But there are so many wounds, so much filth. We have the need of being ready, of being purified. This is our hope: even with so much filth in our souls, in the end the Lord gives us the possibility, cleanses us finally with his goodness which comes from his cross. He thus renders us capable of being forever with him. And therefore heaven is hope, it is justice finally realized. And he gives us also the criteria for living so that this [present] time may also be, in a certain way, heaven, a first light of heaven. Wherever men live according to these criteria, a speck of heaven appears in the world, and this is visible. It seems to me also an evidence of the truth of faith, of the need to follow the way of the commandments, of which we should speak more often. They are truly road signs and show us how to live well, how to choose life. Therefore, we must also speak of sin and of the sacrament of forgiveness and reconciliation. A sincere man knows that he is guilty, that he should start anew, that he should be purified. And this is the wonderful reality which the Lord offers us: there is a possibility for renewal, of being new. The Lord starts anew with us and we can thus start anew also with the others in our life. "You Led Us Through Fire and Through Water"
"You led us through fire and through water, but then you brought us relief." The words of Psalm 66 describe a spiritual promontory of repose and security granted as a kind of resting point along the way of life’s pilgrimage. When the dust settles and the activity of life slows we are granted a vantage point from which to serenely look back with reflection. Thus was presented an opportunity for me, while awaiting a flight from Iraq to Kuwait, to revisit the many events, people and challenges I experienced in months of deployment. I now make the transition back into civilian life after service as a chaplain in support of American military, civilians and Catholics from far-flung places around the globe. The fires the psalmist describes were found in the fear of a mortal enemy and the necessity of wearing armored protection and travelling in armored vehicles and with an armed enlisted assistant at all times. The fires were in the desert summer heat, in the trials of winter cold and sleeplessness, of living without many of the conveniences Americans would consider basic such as potable running water, flush toilets and fresh hot food. The waters were in the January snowstorms and the rain that quickly turned the powder-fine dust of the desert landscape into a mud which held fast in thick layers to the soles of one’s boots. The fires and the waters were in the trials of adjusting to frequent and arduous travel by flights and convoys to remote locations, punctuated by short periods of relief afforded by a few days of rest before setting out again. Through the fires and waters of this world every human person must find the relief that can come from God alone, the reassurance that He still commands all the elements of nature as Creator. Peace of soul can be granted only by Him who can truly say "I have overcome the world". In the crowded events of life that threaten to choke out the spiritual growth that is necessary for Faith, the Lord provides the graces needed through prayer, the one constant source of good that is ever present to us at every step of our pilgrimage. Prayer which is sincere, heartfelt and intentional nourishes the weary and afflicted soul, brings true relief for renewing the hope of the faithful disciple. I wish to thank our Holy Father, Benedict XVI, for reminding the Church that the source of prayer in the Breviarum Romanum of 1962 is still available to all priests, deacons, men and women religious and any members of the faithful who choose to draw from this rich and immemorial source of grace. Beginning the daily praying of the Breviarum for the first time in the dry and desert places of this region where our salvation history began has been a tremendous source of refreshment, or "refrigerium" in the Latin. The challenge and blessing of praying all 150 psalms each week is a grace through which the Lord grants the means of enduring, overcoming and finding the way of salvation after the "fires and waters" through which He has led me in these past months in Iraq. The graces of the Eucharist are extended throughout the day and throughout the week as the hymn of prayer to God is chanted, intoned and proclaimed through the elements of worship in Scripture and chant. The richness of the Church’s prayer in the Church’s unifying language of Latin includes the grace of praying daily in union with our Holy Father in Rome and millions of faithful, ordained and lay, religious and secular, all around the globe. The universality of the Church’s life of grace is powerfully experienced through prayer in the Latin language that both belongs to no one, because it is no longer a living language in the ordinary sense, but also belongs to everyone for the same reason. As well, the grace of praying in union with the Church of the saints and martyrs reaching back for over a thousand years reinforces our living communion with both the Church triumphant in heaven and the Church suffering in Purgatory. The world is hungering for God and the greatest danger for souls are the threat to faith by the fires and waters through which we are led. Souls "tested as gold by fire" stand in danger of falling away from the Faith without the constant strength God gives through profound prayer. The priest who is faithful to the daily recitation of the Church’s prayer of the Liturgy of the Hours, or Breviary, is a necessary sign for others that everyone is need of communion with the Father through prayer. Prayer which is a sincere, regular and disciplined union of mind and will with God is indispensable. The life of the Lord Jesus is lived here and now in imitation of His own spiritual communion with the Father in the Holy Spirit through prayer. Our gift of baptismal grace is not lived out in the fullest sense without a daily entering into the chamber of the heart, whereby we "close our door and enter our room and pray to the Father in private". 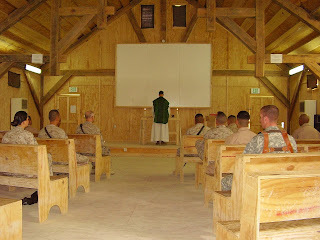 "I have been a sojourner in a foreign land" (Exodus 2:22) and faced trials and dangers in a life shared with our military men and women in a unique privilege to serve their living Faith. The graces gained through obedience to the Lord who commanded the Church to "pray always" preserved and increased the joy and consolation of the Father’s love and presence through many trials and difficulties. The road ahead for every human person promises joys and sorrows, good and endurance of evil. Prayer and the interior life are God’s promise of aid, counsel, wisdom, strength, hope and love through all that life will bring. "You led us through fire and water, but then you brought us relief." "Christ has become poor for your sake"
Our Holy Father's message for Lent 2008 reminds us of the three necessary tasks for Lent: prayer, fasting and almsgiving. Through these we learn to live as Christ our Lord did, poor for the sake of others. One receives the gift of Divine Love only with attention and devotion. Christ is not a pet one simply harnesses and then seeks out when lonely or a pretty bauble that one places on a shelf and then must remember occasionally to dust. One possesses Him only in love, in conversation which is attentive prayer of the heart and mind. In the daily labor of freedom from things which are only passing in this world we learn to attach ourselves more and more to Him who alone will last forever. This is the reason for being poor in Spirit: so that true wealth, Christ the life of the soul, may be our one lasting possession. Poverty of spirit is freedom for love. Meeting Christ in the Liturgy offers a reflection for The Fourth Sunday in Ordinary Time. Photo by author: Cinque Terre, Liguria, Italia.